Download a pdf version of the Care and Support Framework [875kb] May 2018. The Children (Guernsey and Alderney) Law 2008 (Children Law) introduced a welfare based, integrated model for responding to concerns about children, including children in need, children at risk of serious harm and children at risk of compulsory intervention. The Children Law is underpinned by a set of key principles which have at their core the welfare of the child as the paramount consideration. The Children Law created the Child, Youth and Community Tribunal (CYCT) and the role of the Children's Convenor. The CYCT replaces the court in the majority of cases where compulsory intervention is required. More information on the CYCT and Children's Convenor can be obtained at www.convenor.org.gg. Most children have a number of basic needs that can be supported through universal services. These universal services include education, child health, early years' provision, housing, youth services and voluntary organisations. The Law however recognises that some children will need additional services to achieve a reasonable standard of health and development and some will need compulsory intervention. This document provides a framework for professionals who are working with children and families. It aims to help professionals identify when a child may need additional support to achieve their full potential. It introduces a continuum of help and support, provides information on the levels of needs and gives examples of some of the factors that may indicate a child needs additional support. The framework recognises that however complex a child's needs, universal services will always be provided alongside any specialist additional service. It is recognised that children's needs are not static and that they may experience different needs at different times throughout their childhood years. The indicators of need contained in this document are not exhaustive but provide examples that can be used as a tool to assist assessment, planning and decision making when considering the needs of children and their safeguarding needs in particular. This document should be used in conjunction with the Island Safeguarding Children Partnership (ISCP) Interagency Child Protection Guidelines. For some areas of need there may also be specialist tools available for assessment such as the Salford Graded Care Profile for neglect, The MASH Domestic Abuse Referral Pathway. Remember where there is an urgent and immediate need to protect a child dial 999 to contact the Police. Otherwise for all other children who may be at risk of significant harm, contact the MASH as soon as possible. The Children Law sets out some principles that underpin decision-making and actions taken under the Law. These apply not only to the Court and Tribunal but also to professionals. The overriding principle of the Children Law is that the child's welfare is the paramount consideration. When carrying out any function under the Law public authorities must take into account any of the child welfare principles that are relevant ( Section 3(2). g) the effect or likely effect of any change in the child's circumstances, including the effect of the child's removal from Guernsey or Alderney. Is adversely affected, or likely to be, by the disability or illness of a family member. Additional services are those deemed over and above the usual universal services provided to all children by the States of Guernsey which include ordinary schooling, routine immunisations and health checks. (1) A child is at risk when s/he is believed to satisfy the grounds for compulsory intervention (Section 35 of the Children Law). (b) at least one of the conditions referred to in subsection (2) is satisfied, in respect of that child. (g) the child (being under the upper limit of the compulsory school age) is failing to attend school without good reason. One of the key elements of the Children Law, which is reflected in the CYPP is the duty placed upon agencies to work together and share information. The Guernsey and Alderney Child Protection Guidelines set out how agencies should work together and under what circumstances information can and should be shared. The States of Guernsey Information Sharing Guidance provides guidance on local procedures for information sharing. It is recognised that no single agency can meet the identified needs of all children in need or at risk. In seeking to ensure the wellbeing of children in the Bailiwick, this creates an imperative for interagency communication, cooperation and collaboration to seek to reduce the risk of significant harm or impairment to a child's health or development. All States of Guernsey employees and other persons have a duty whilst they are working with a child whom they reasonably believe is in need, or at risk, to take such action in relation to that child, and his circumstances, as may be required of them under the Children Law. The Children Law also reflects the principle of providing integrated help and support at the earliest possible point for children and families to prevent problems developing or escalating to the point that the child is at risk. A Multi-Agency Support Hub (MASH) has been introduced to support this. Other agencies who attend regularly include: the Child and Adolescent Mental Health Service (CAMHS), the Community Drug and Alcohol Team (CDAT), The Hub (Youth Commission), the Youth Justice Service, and Action for Children. The Children (Miscellaneous Provisions) (Guernsey and Alderney) Ordinance, 2009 (the Children Ordinance) sets out the obligations of States Committees to identify, assess, report, record and investigate circumstances where children might be in need or at risk. Where it appears a child is in need HSC, or in certain circumstances, Education Services may assess the extent to which the child is in need (s.25 of the Children Ordinance). Section 26 gives HSC a duty to investigate circumstances where compulsory intervention may be necessary. In cases where the concerns arise mainly from a child's failure to attend school Education Services are responsible for discharging the duty. Where concerns about a child come to the attention of a States Committee, they must make sufficient inquiries to determine whether or not the concerns about the child should be reported to HSC (s25 of the Children Ordinance). 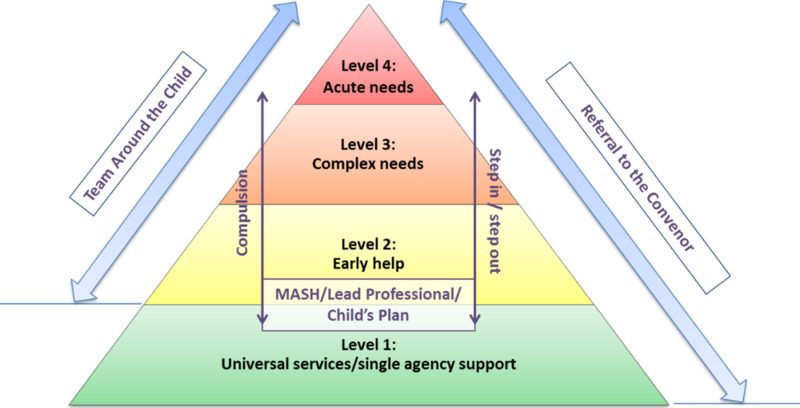 If you work with children in Guernsey or Alderney and believe a child you work with is in need of additional support or is at risk, you should make enquiries to the MASH in writing using the MASH enquiry form. The MASH will then decide what will happen next. The MASH agencies will carry out initial inquires to identify the child's needs. This may lead to children being signposted to other agencies for support, no further action or a child protection investigation being undertaken. Where it appears that further assessment of the child's needs by a social worker are needed the matter will be referred to one of the HSC locality teams. Where there may be a need for compulsory intervention a referral will be made to the Children's Convenor, who will investigate the case and decide whether there are grounds to refer the child to the Child, Youth and Community Tribunal (CYCT). In addition to referring to MASH, any person (who believes that compulsory intervention may be necessary to ensure the provision of adequate care, protection, guidance or control for a child) may refer the matter to the Convenor at any time. If, following investigation by HSC, it is thought that the child may be in need of compulsory intervention HSC will refer the matter to the Convenor. These are children with no additional needs; all their health and developmental needs will be met by universal services. These are children who consistently receive child focused care giving from their parents or carers. The majority of children living in the Bailiwick require support from universal services alone. These are children with additional needs, who may be vulnerable and showing early signs of abuse and/or neglect; their needs are not clear, not known or not being met. These children may be subject to adult focused care giving and the question of compulsion should be considered. 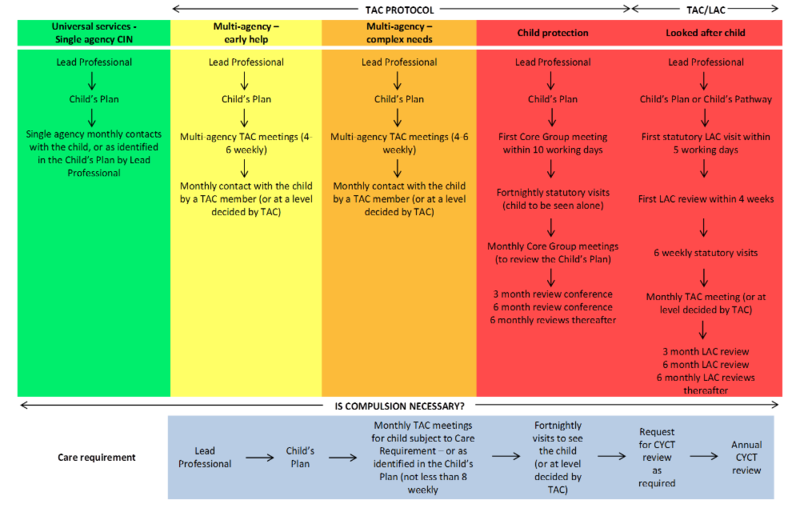 Level 2 is the threshold for multi-agency early help through the Team Around the Child (TAC) process, an identified lead professional and a child's plan. These children require a coordinated approach to the provision of additional services such as family support, parenting programmes etc. These children require specialist services in order to achieve or maintain a reasonable standard of health or development or to prevent significant impairment of the health and development and/or who are disabled. In some cases these children's needs may be secondary to the adults' needs. The question of whether compulsory intervention is required should be considered. These children may require long term intervention from specialist services. This is the threshold for an assessment (child's plan) led by children's social care. These children are suffering or are likely to suffer significant harm. This is the threshold for child protection. These children are likely to have already experience adverse effects and to be suffering poor outcomes. Their needs may not be considered by their parents. Compulsory intervention is likely to be required to overcome adversity and risk. This level also includes children with significant health care needs and those who require specialised care away from home. The question of whether compulsory intervention is required may arise at any level of need. For the majority of children who have additional needs their parents or carers will work with additional and specialist services to ensure that their children's need are met. Some however will be either unwilling or unable to access appropriate advice and support. Where it is considered that compulsory intervention may be necessary to ensure that a child or young person's needs are met a referral to the Convenor should be made. Children's needs do not necessarily remain constant throughout their lives; they can move between levels of need. Also, children in the same family can have different levels of need. The "My World Triangle", developed in Scotland is used within Guernsey & Alderney to assess the needs of children and their families. 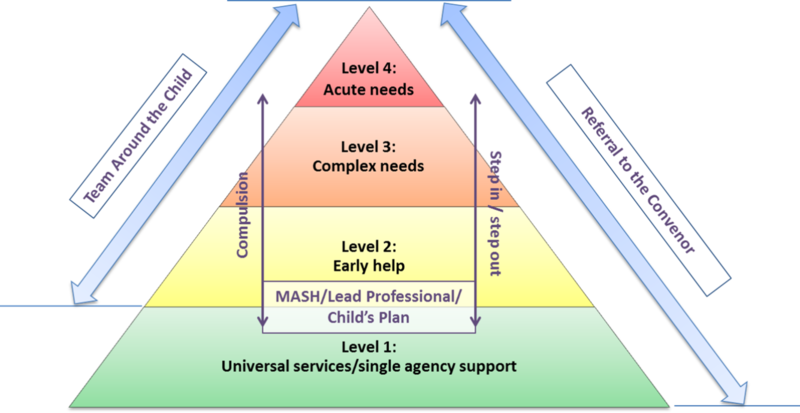 The "My World Triangle" was significantly influenced by the UK Department of Health's "Framework for the Assessment of Children in Need and their Families" and will therefore be familiar to those professionals who have trained or worked in the UK. 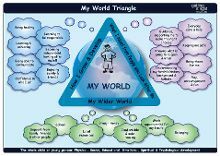 The "My World Triangle" is used at every stage to think about the whole world of the child or young person including risks, needs and positive features in their lives. It has been designed so that the language used is accessible to children and young people. The My World Triangle should be used to identify the interplay between the three domains to assess the child's needs and form a judgement regarding the level of need. The indicators of need on the following pages are designed to provide practitioners with an overarching view on what tier of support and intervention a family might need. This is not intended to be a 'tick-box' exercise, but to give a quick reference guide to support professionals in their decision making, including conducting further assessments, referring to other services and understanding the likely thresholds for higher levels of intervention. Remember that if there is a combination of indicators of needs under Level 2, the case may be a Level 3 case overall. Also remember that need is not static; the needs of a child and family will change over time. Where a plan has been agreed this should be reviewed regularly to analyse whether sufficient progress has been made to meet the child's needs and on the level of risk face by the child. This will be important in cases of neglect where parents and carers can make small improvements, but an analysis will need to be undertaken on whether this leads to significant improvements for the child. If you have child protection concerns consult the ISCP Child Protection Guidelines and you must inform your safeguarding lead or line manager.